There are two basic ways of measuring your improvement progress in Target Archery, one is a broad indicator called the Classification System and the other a more accurate way called the Handicap System. 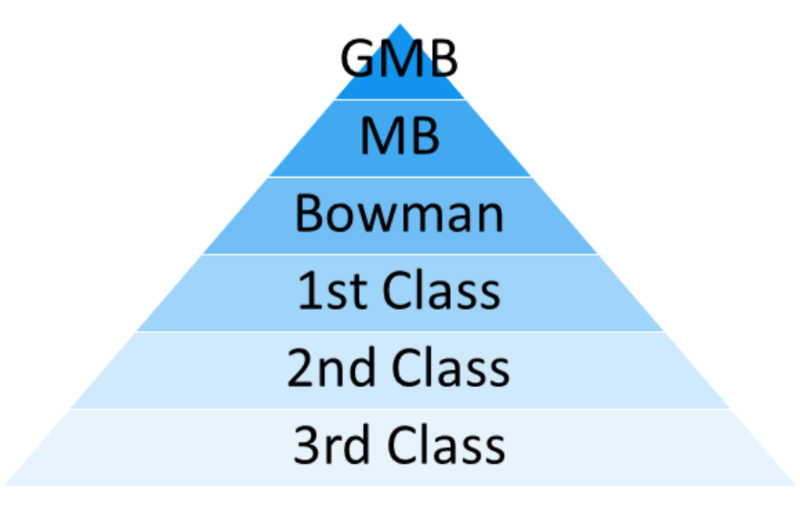 Classification System - is a system which has evolved over many years and thousands of scores for Rounds and this data has been collated and a percentile arrived at whereby a pyramid shape of layers is achieved, with a bottom broad layer of 3rd Class Archers and a tiny top layer of GMB (Grand Master Bowman) Archers. The two factors which affect what Classification can be achieved when shooting a specific Round are the Distances involved in shooting that specific Round, and the number of Arrows shot in that Round i.e. progression up the pyramid involves shooting both longer distances and more arrows. A Classification is achieved by shooting three scores which are above the level set for a Classification in the round you have shot . For example you shoot 2 Western Rounds and one National Round and the first score you get is above that for 3 rd Class but below that for 2nd Class, the second Round you shoot is again above that for 3rd Class but below that for 2nd Class and the third Round you shot is above that for 2nd Class but below 1 st Class. You will have now shot a 3rd Class; another 3rd Class and a 2nd Class so you have now become a 3rd Class archer and can be awarded a 3rd Class Badge. But to take it a bit further if you now shoot 2 more Rounds and the scores you achieve are a 2nd Class and a 1st Class you will have shot 3 scores at 2nd Class and above so become a 2nd Class Archer. Notes on achieving Classifications: - Up to and including Bowman Classification can be achieved in the Club and the badges are awarded by the Club, Master Bowman and Grand Master Bowman are achieved at Record Status Competitions and are claimed through Archery GB and the respective badge awarded by Archery GB. The Classification of Archer that you currently are lasts one year i.e. if in the year 2011 you achieved Bowman then in 2012 you would state that you are a Bowman Archer if asked when entering a competition (if asked on the Entry form). If during 2012 you don’t make Bowman but did make 1st Class then in 2013 you would be a 1st Class Archer. Archers Mate on the Documentation Page of the Website give a handicap score when a score for the Round shot is entered. Notes on Handicaps: - They are used to see which Club Archer has improved the most throughout our (Club) Outdoor Season (both Senior and Junior) then those who improve the most are awarded the clubs Senior and Junior Handicap Improvement Medals, these medals are provided by Archery GB. They can be used Indoor and Outdoor so that two or more archers with different current handicaps can shoot against each other to see who shot best on that day this is achieved by looking up an Archers Handicap in a table called ‘Allowance for Round’ then giving that archer an allowance of points depending on the Handicap. I.e. archer A who has been shooting for 20 years and has a low handicap will get less allowance than Archer B who has been shooting for a year and has a higher Handicap and the resulting scores plus their allowance is added together and whoever shot the best on the day should win (so if both shot exactly to their Handicap they should end up with exactly the same total amount of points). The club tries to fit in both an Indoor and Outdoor Handicap shoot towards the end of each season.